There are various reasons that can cause MP4 no sound problems. Some cases can be extremely rare in practice and you shouldn’t be trying to fix them yourself anyway. In this article, we will mainly talk about the top 3 causes which can be easily fixed by your own. If the MP4 files become corrupted or damaged, you may be disappointed to find that even the powerful Windows Media Player and the all-inclusive VLC player sometimes can’t play the files. The good news is that you can recover them with some professional media recovery programs such as Jihosoft MP4 video repair tool. If you are having problems with media playback on your computer when using Windows Media Player, VCL, QuickTime, Media Player Classic, etc, you can simply uninstall it and try to install the right one. If your MP4 file is not corrupted and your Media Player are also properly installed, then the MP4 no audio issue can be caused due to the unmatched codec. As a multimedia container format, the MP4 file can be encoded with various different audio codec such as MP3, WMA, AAC, AC3, DTS, LPCM, ALAC, DTS-HD. However, the audio codec supported by desktop and mobile device media player application will be limited to just few ones. If the MP4 are using a codec that’s not supported by your media player app, you will definitely miss the sound. If the MP4 no audio issue is caused due to unsupported audio codec, what you need to do is perform a codec transcoding process. 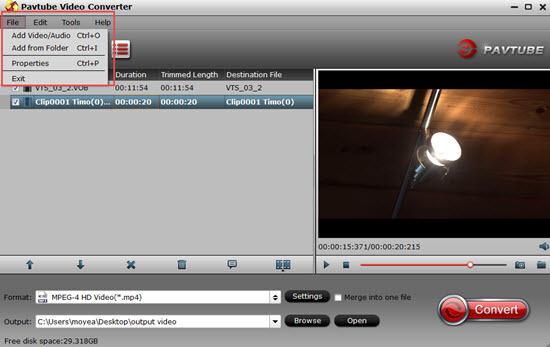 Here, you can get the job easily done with our best MP4 Video Converter - Pavtube Video Converter. The program has full support for all 4K/2K/HD/SD MP4 files encoded with different video compression codec like MPEG-1, MPEG-2, MPEG-4 (A)SP, H.264/MPEG-4 AVC, H.265/HEVC, VC-1/WMV, MVC and audio codec like MP3, WMA, AAC, AC3, DTS, LPCM, ALAC, DTS-HD. You can easily produce any of your favorite media player app compatible video and audio codec with best quality and super fast conversion speed. The program supports batch conversion mode, so that you can batch import multiple MP4 files into the application for conversion at one time. For advanced users, you can flexibly adjust output profile parameters such as video codec, resolution, bit rate, frame rate, audio codec, bit rate, sample rate, channels, etc as you like to get better output quality. Download the free trial version of the program, install and lauch it on your computer, on the main interface, click “File” > “Add Video/Audio” or “Add from Folder” to load MP4 files into the program. 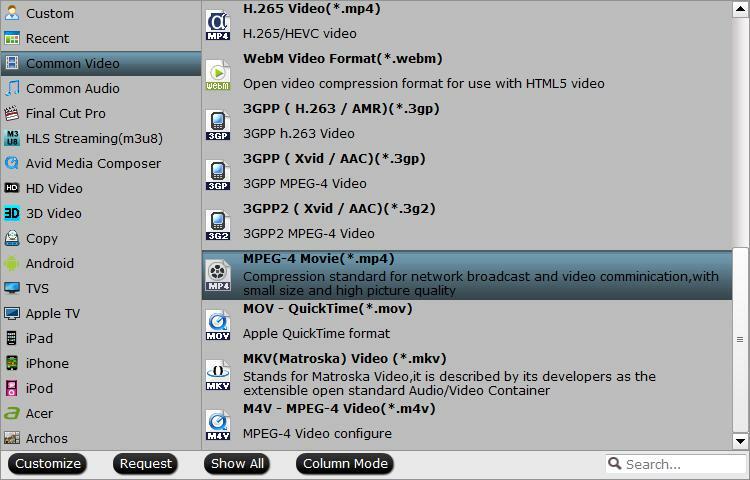 From “Format” drop-down bar list, select one of your media player app supported file formats such as “MPEG-4 Movie(*.mp4)” under “Common Video” main category. You can also choose other formats according to your own needs. Click “Settings” to open “Profile Settings” window, choose the output audio codec as “aac” which can be played with no problem with all media player apps. Go back to the main interface, hit “run” button to begin the conversion from MP4 to media player compatible video and audio codec conversion process. When the conversion is done, you will have no MP4 audio playback issues any more.